We’re only a couple of hours away from the National Hockey League’s trade deadline, which is today at 3 p.m. Eastern. But NHL teams have been busy over the last week or so, and some big names have already been moved. The latest trade has taken Tampa Bay Lightning star Martin St. Louis to the New York Rangers in exchange for the now former Rangers’ captain Ryan Callahan, a 2014 conditional second-round draft pick and a 2015 first-round pick. It was well known that St. Louis had put in a request to be traded. We aren’t sure of all of the reasons, but it’s safe to say the St. Louis original exclusion from the 2014 Canadian Olympic Team didn’t help. That decision came from Canadian General Manager Steve Yzerman, who just so happens to be the Lightning’s GM. This decision makes sense for both teams in our opinion. St. Louis will provide scoring for the Rangers while Callahan is a gritty, hard-working forward that can put the puck in the net too. Plus the Lightning are getting Steven Stamkos back from injury, which more than makes up for losing St. Louis’ goal scoring. Tuesday’s big deal included Roberto Luongo returning to the Florida Panthers. He was traded from the Vancouver Canucks along with forward Steven Anthony. The Canucks received goalie Jacob Markstrom and forward Shawn Matthais. To be honest, this trade only makes sense for the Panthers and Luongo, who still owns a home and has family in Florida. The Panthers are looking to become Stanley Cup contenders and now have the financial backing to make that happen. So taking on Luongo’s huge contract was feasible. The trade now gives them a potentially stellar goaltending tandem, depending on whether or not Tim Thomas can keep performing well. We know Luongo will remain consistent as he has year after year. For Vancouver this could spell the start of a rebuilding era. When we look back to last season, when they had stud goaltenders Luongo and Cory Schnieder, the team had to make a decision on which guy to go with. Luongo’s contract was too big to move at the time, so the team moved Schneider, who is now the main guy for the New Jersey Deveils. Now they’ve gone and moved the guy that they stuck with as their number one. It doesn’t make sense! The Canucks are now left with the young Eddie Lack, who has potential but hasn’t shown that he can provide the type of consistency that Luongo has, and the young Markstrom, who has had plenty of opportunities in Florida to shine but hasn’t really stepped up. It will be interesting to see what happens with the Canucks moving forward, especially since there are rumors that they are trying to move forward Ryan Kesler. More goalies were moved yesterday with Ilya Bryzgalov going to the Minnesota Wild and Viktor Fasth being shipped to the Edmonton Oilers. Bryzgalov’s move now gives the Wild a veteran goalie to back up young Darcy Kuemper, who has shined since taking over for the injured Niklas Backstrom and the sick Josh Harding. You really can’t go wrong with Bryzgalov and his experience. Just don’t get him talking about the universe. For Edmonton, the acquiring of Fasth now gives them a major upgrade over what the team started the season with. Especially after the Oilers just signed Ben Scrivens to a contract extension. The Oilers traded a 2013 third-round pick to the Los Angeles Kings for Scrivens in January. The move has turned out to be a smart one now that they’ve added Fasth. Scrivens and Fasth have the potential to be a great goalie pairing going into the future. The Ottawa Senators have also been busy today as they make a push for the playoffs. The team has signed defenseman Chris Phillips to a two-year contract extension, they’ve put Cory Conacher on waivers – he has been picked up by the Buffalo Sabres – and they acquired forward Ales Hemsky from the Edmonton Oilers. Putting Conacher on waivers doesn’t really make sense. But signing Phillips to an extension and adding Hemsky does, especially since the team is fighting for one of the final playoff spots in the Eastern Conference. The other really big trade happened last Friday, February 28, when the Sabres traded star-goalie Ryan Miller and forward Steve Ott to the St. Louis Blues. In return the Sabres got goalie Jaroslav Halak, – who may very well be moved again – forward Chris Stewart, forward William Carrier, a 2015 first-round pick and a 2016 conditional third-round pick. Way to go St. Louis! Miller is a stud, arguably one of the best goalies in the NHL, and now he is on one of the better teams in the league. This is a great move by the Blues. Stay tuned for more trade action. There are two hours left and we can guarantee that there will be some more news. Referee Mike Leggo makes a controversial no-goal call during the San Jose Sharks vs. Buffalo Sabres game on Nov. 5. There has been some talk around the local rink about the controversial no-goal call during the San Jose Sharks vs. Buffalo Sabres game on Nov. 5. Many believe that referee Mike Leggo and the National Hockey League officials in the Toronto-based war room blew the call by waiving off what looked like a clear goal. However, the NHL has defended the call under the ‘intent to blow the whistle’ rule, and rightly so – you can read the CBSSports.com story and watch the video here. Whether you agree or disagree, we support Leggo’s on-ice decision as well as the League’s support of the call. 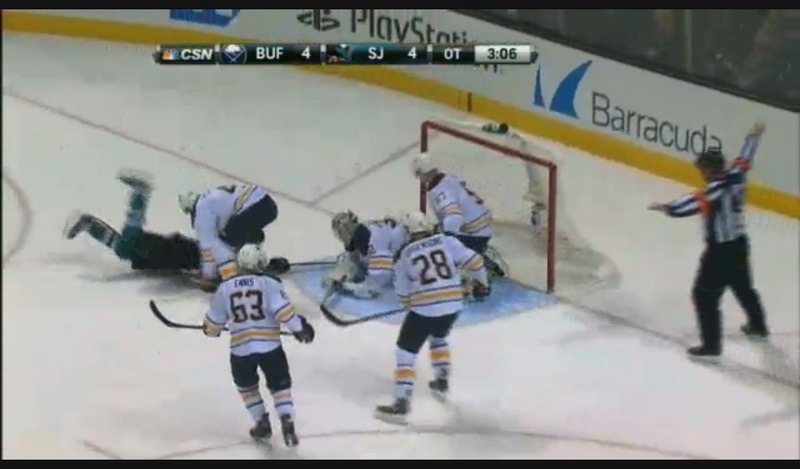 The puck obviously crossed the goal line, but only after Leggo clearly lost sight of the puck under Sabres’ goalie Ryan Miller. In fact, the only person on the ice who seems to have had eyes on the puck was Sharks’ forward Tommy Wingels. Therefore, the play should have been whistled dead. But here is where the controversy arises, and Leggo can be called out for making a mistake. To the untrained eye it appears the Leggo does everything right except blowing the whistle at the right time. So what is Leggo’s mistake? Showmanship. He correctly washed out the attempt that hit the goal post so that everyone in the arena knew it wasn’t a goal. But he also held his arms out for far too long in a great impression of Jay Jay the Jet Plane. We believe there would have been no issues with the call if Leggo correctly washed out the goal in the quick fashion officials are taught. He would have had his whistle in the correct position in time to blow the play dead when the puck was under Miller. Instead he held the signal and put himself in a tough situation in which he obviously had to think about the call. Thankfully he ended up making the right one and did so with conviction. It was made worse thanks to the NHL’s mistake of not having Leggo put on the headset to talk with the officials in Toronto and discuss the call. As noted in the CBS Sports story, the NHL acknowledges that it messed up here. The pushback and claims of a blown call could have been far less if they got this right. Either way, the right call was made in the end, and we’re sure that lessons have been learned too.